Every June, select high school students completing their sophomore and junior years from across the Commonwealth, head to the University of Kentucky’s Lake Cumberland 4H Education Center to experience a weeklong adventure exploring Kentucky’s forests, wildlife and bugs. The Kentucky Forest Leadership Program (KFLP) began over 50 years ago and has greatly evolved during that time. It is all made possible with the cooperation of the U.K. College of Agriculture, the Food and Environment Cooperative Extension Service, the Kentucky Division of Forestry and the Kentucky Division of Conservation. “The first day of camp participants get introduced to one another, the subject they will be investigating for the week and then they learn the basic tools to gather some of the information for their investigation”, said Laurie Taylor Thomas, KLFP Coordinator and Extension Forester with the U.K. Department of Forestry. “Consulting firms” made up of students from each track, or area of interest- forestry, wildlife and entomology- and are gently guided by a wide variety of natural resource professionals as they collect data and do investigations throughout the week. At the end of the week the students come back collectively with their firm and share their findings. From there, the students then create a management plan for the 80 acres of mixed forestland they have been assigned. This teaching experience allows the students to learn through peer teaching throughout the week instead of the usual student/teacher experience giving a definite more hands on experience and one many won’t forget. Reminiscing on their adventures, the campers eyes widen and their voices practically bounce off one another as they finish each other’s sentences, stand up to tell stories and of course, laugh constantly. And though most campers agree that the camp left them with new skills, clearer priorities and enhanced confidence, they certainly did not forget to have fun. But the camp fun wasn’t only limited to the student campers. Forester Chris Oelschlager with the Kentucky Division of Forestry, has been involved with the program since 1997. When she began teaching at the camp, she wasn’t much older than the students and admits to having as much fun, if not more than the campers. For the adult professionals leading the activities, it’s also nice to get to spend so much time with the students and to see the forest through their eyes. The Kentucky Division of Forestry’s participation in the program is important because it not only exposes the students to what foresters do, but what the division does also. Many of them have parents and relatives who own woodlands. As the campers return to their homes, the division hopes they’ll share what they learned with their parents and communities. This year’s camp begins June 4-9, 2017. For more information about the Kentucky Forest Leadership Program, go to https://kflp.ca.uky.edu. For information about the Kentucky Division of Forestry and its many programs including landowner assistance, go to http://forestry.ky.gov. Austin Williamson smiles as he meets a friendly stink. Elijah Schultz smiles for the camera. Forester Chris Oelschlager, is pictured with her team of students on the last day of the camp. A camper holds a ring-necked snake, one of the many opportunities the campers have to handle “critters” throughout the week. Forest Ranger Kenny Pyles demonstrates how to plow a fire line with a bulldozer, and also demonstrates forestry Best Management Practices on a steep forest road. Forest Ranger Susan Nightingale speaks to the students about wildland firefighting. Ranger Susan Nightingale (in red hard hat) shows the campers how to fight wildfire by creating a “hand line” with fire rakes. 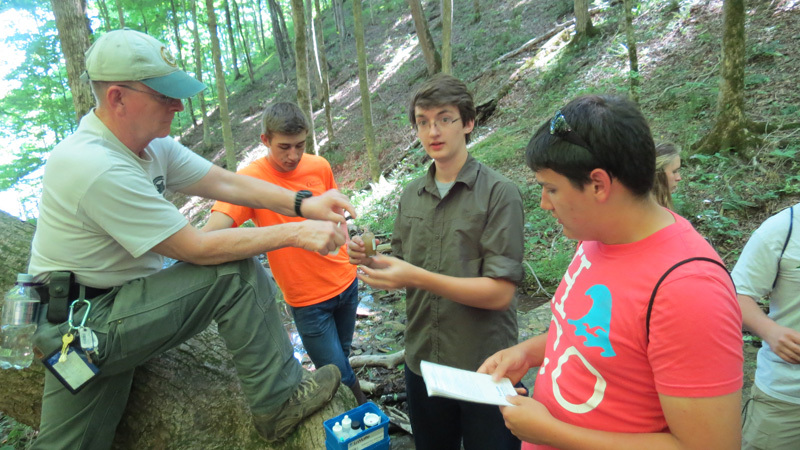 Elijah Schultz learns about water quality parameters and aquatic macroinvertebrates at a tributary to Lake Cumberland. Elijah Schultz samples insects from a wetland on the property the students spent the week exploring.